Andy Warhol captured the likeness of anyone within five minutes of fame as well as of anyone else who could afford him. Warhol was “the court painter of the 70’s”, as art historian Robert Rosenblum described, and he began a new era for portraiture. His subjects were artists and ‘outcasts,’ movie-stars and friends, monarchs and athletes, basically anyone who could grace covers of magazines, gossip columns or newspapers. During the late 1960s Warhol moved away from sourcing his imagery from the tabloids and began working from his own photographs. Use of the bulky Polaroid “Big Shot” was his preferred method; the camera was perfectly outfitted for close-ups. Warhol loved the decisions that the camera made for him, producing an instantaneous image that could be easily translated to screenprinting. Warhol’s portraiture enshrined a glamorous, talented and showy ‘court;’ private commissions rolled in and became his big business. At first Warhol was chasing after the rich and famous but then the rich and famous chased him. Through his commissions Warhol attained a notoriety that harkened back to an age when artists were financed by wealthy patrons. Everybody who was anybody from the scene of Studio 54 or from Warhol’s cool and stylish Factory crew wanted a portrait. Marilyn Monroe's image most fascinated Warhol. Creating several works from the same publicity photo of the actress, Warhol left for the world bold commemorations of her tragic end. 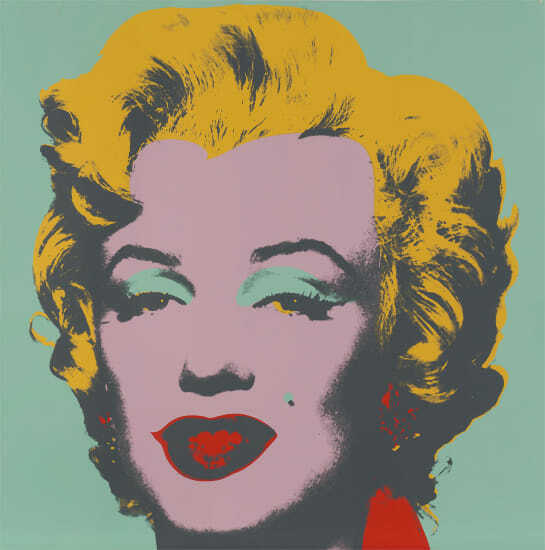 The misalignment of contours, bleached out shadows, bright yellow hair and cherry red lips of lot 53, Marilyn Monroe, indicated Warhol’s signature palette. Marilyn looked familiar, yet by Andy’s hand she became different, at once removed from our world while still appearing tangled by the realities of it. Throughout the 1970s and early 1980s Warhol’s portraits become simpler as he abandoned gestural elements. Lot 55, Mao, was an impish rendition of an iconic symbol now seen with blue lips. A child-like approach to coloring appeared again in his later 1985 portrait of Queen Margrethe II of Denmark, lot 62, from his Reigning Queens series. Lot 60, Georgia O’Keeffe, was among Warhol’s earliest uses of diamond dust in portraits. In this portrait Warhol refined the artist’s image; O'Keeffe appeared contemplative and serious, revealing of Warhol’s admiration for the renowned painter. In lot 54, Muhammad Ali, there was a similar richness of printing as well as a sense of depth created through the use of miss-registration and overprinting. While at first glance full insouciance, Warhol’s portraits upon closer viewing revealed something deeper about his sitters, all surface to be sure and yet full of prescient observations.